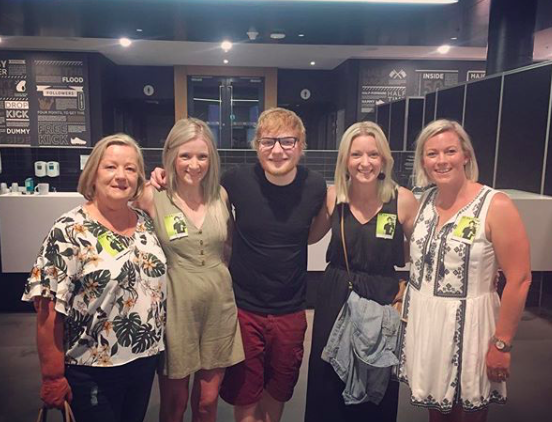 Ed Sheeran made one of his fan’s dreams come true just before playing to a sell-out crowd in Adelaide, Australia. One fan planning on going to the gig was Sherie Hagger who was diagnosed with stage three bowel cancer for the second time in her life in 2016. But the determined 32-year-old did, and she got to meet the man himself. I suffer severe insomnia and one night whilst wide awake in bed at probably 3am, about a week before his Adelaide concert, I had an idea… maybe I can try and find someone to organise a meet and greet… that would most definitely give me the lift that I so desperately needed and wanted. I’m responsible for my own wellbeing and I need to focus on doing things that keep me happy and motivated. In the 21 years of having severe Crohn’s disease and just over four years of bowel cancer, I’ve not been one to put my story out there purely for any sort of gain, other than to raise awareness and to try and reduce the risk of this happening to anyone else. I have not allowed any GoFundMe’s in my name, ever. There have been no Facebook posts asking for help – other than donations to charities or to share my blog to spread my story for awareness. I don’t hint for freebies… I simply do not and will not use the ‘cancer card’ for any sort of personal or financial gain. This is in no way a criticism of others who do things differently than I, but I just wanted to give you a brief understanding of the type of person that I am… many would call me stubborn and I would say that is spot on. Sherie added some links to her blog page and her Facebook page to an email and asked if it would be possible to meet Ed. It was as simple as that. I didn’t beg, I wasn’t over the top, (if anything I played my situation down a bit) and sent it to as many people I could think of: radio stations, charities and tour promoters etc. So yes… it happened, it actually happened, and I still pinch myself to this day, and look back at my photos to make sure it wasn’t a dream. I was in a small group of approximately 16 people, most of which were young children that are unwell, and their parents/guardians. We all had our own time with Ed, I can’t really tell you how long I spent with him, nor what we talked about, because it’s all such a blur. What I can tell you however, is that the way he comes across in the media, is exactly the way he is in real life. So what’s Ed Sheeran like? At the Adelaide concert there were fans camping outside the venue for days in advance, to make sure they got prime position! Ed organised for pizzas to be delivered to them.